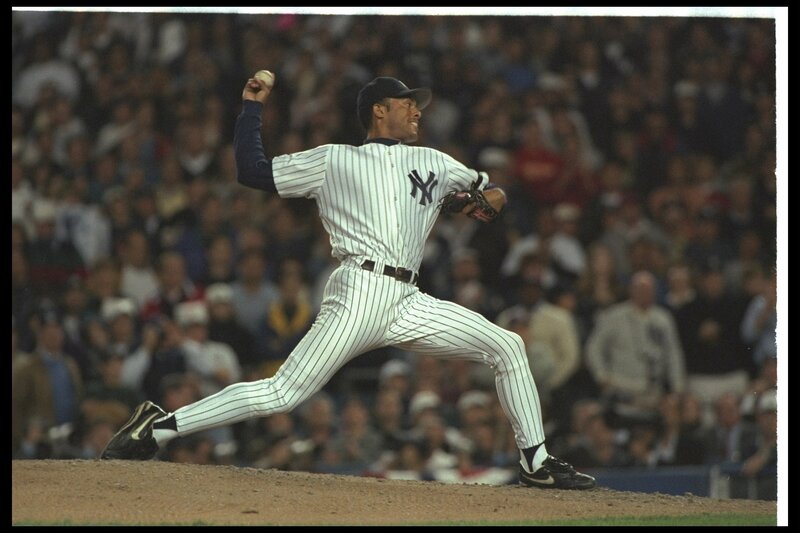 Mo throws a pitch in Game 6 of the 1996 World Series (Photo Credit Yahoo!). 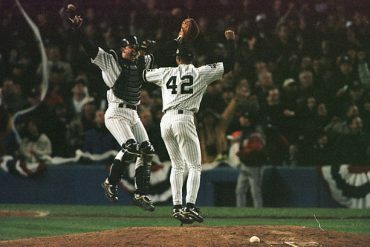 My favorite memory of Mariano Rivera was in Game 6 of the 1996 World Series. 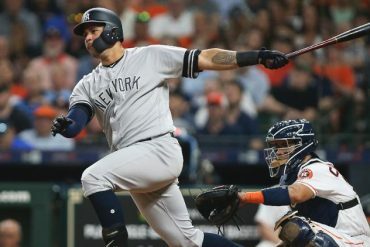 It was the top of the 8th inning, and the Yankees had a 3-1 lead. Mariano, the setup man for John Wetteland entered the game in the 7th, and shut the Braves down. In the 8th, with 2 outs, Mariano struck out the last batter of the inning to send the stadium into a frenzy. I can’t remember ever hearing the stadium as loud since. The Yanks were on the brink of winning their first World Series since 1978 and Mo was as cool as a cucumber. That was the moment I knew we had someone special. My distinguishing memory from the great Mariano Rivera has to be game 7 of the 2003 ALCS against the Red Sox. The Yanks/Sox rivalry was at its peak and the two teams were battling into extra innings for a spot in the World Series. Rivera pitched 3 scoreless innings, a rarity for a closer, but when it is possibly the last game of the season, you attempt to defy conventional wisdom and do anything you can to win. And, on that night, Rivera did just that. His 3 scoreless innings got the Yankees to the bottom of the 11th, where Aaron “Bleepin” Boone hit the first knuckleball he saw from Tim Wakefield deep into the night sky and the Yankees were on their way to the World Series. Amidst the exuberance, Rivera showed a rare moment of emotion when he made his way onto the field and collapsed on top of where he belongs, the pitcher’s mound, the mound he so masterfully commanded earlier that night. It could not have happened any other way. 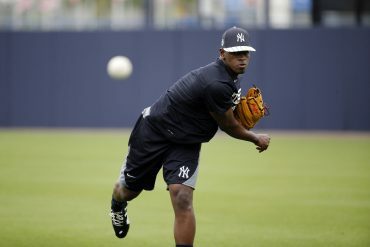 Mo earns his first career RBI on the same night he earns his 5ooth save (Photo Credit nj.com). This could be because it is an in state rivalry, always like beating the Mets, or maybe it’s because it is a first I can say I witnessed of Mariano Rivera’s legendary career. 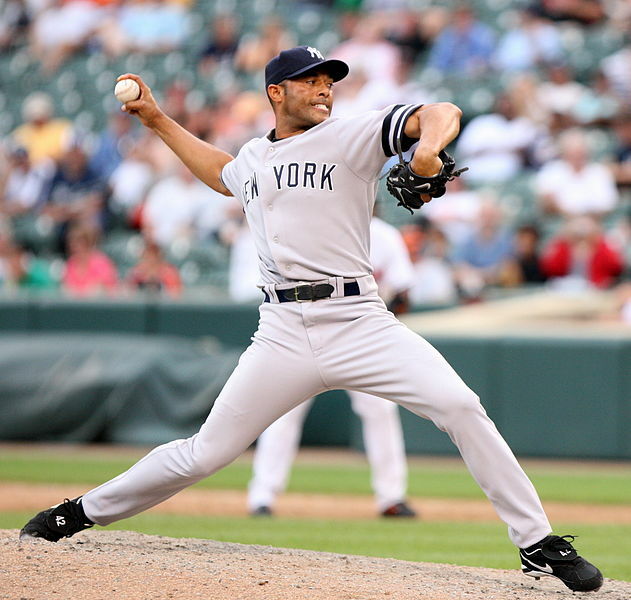 On June 28, 2009, with the Yankees visiting the Mets at Citi Field, Mariano Rivera was called on for a four out save. Of course this was not the first of his career; though he would be going for his 500th career save. It was what happened in the 9th inning that was a first. Mets closer Francisco Rodriguez was always known for being a wild pitcher and it produced the unexpected, Rivera’s first career run batted in. 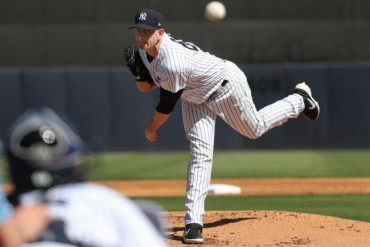 With the bases loaded, it took 7 pitches, including a ball Rivera fouled off, but a high 3-2 pitch would let Rivera take first base and send the crowd into an uproar as the lead increased en route to 500 career saves. 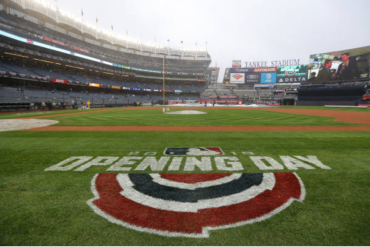 The great Mariano Rivera showed he can do just one more thing. It’s hard for me to single out one Rivera moment and call it a favorite. However, on this night in 2009, Rivera showed what he has been about over his entire career in Baseball. We often see relievers jump and dance around on the mound after a big out. Rivera always acted like he’s done it before. He always treated a save in October the same way as a save in April. Even-keeled, cool and calm with class and dignity. Rivera struck out Gary Matthews Jr. to send the Yankees to the World Series for the first time since 2003. From looking at the picture, you would have no idea Rivera just secured the pennant. This morning’s news conference. When push comes to shove, this morning was the biggest reminder of an athlete who became a superstar in New York, yet didn’t let the big city feel get to him. He emerged as not only a great ballplayer, but as an all-around class act. To me, this morning’s news conference was all the things that define Mariano Rivera: classy, humble, and yet, still the greatest of all-time. 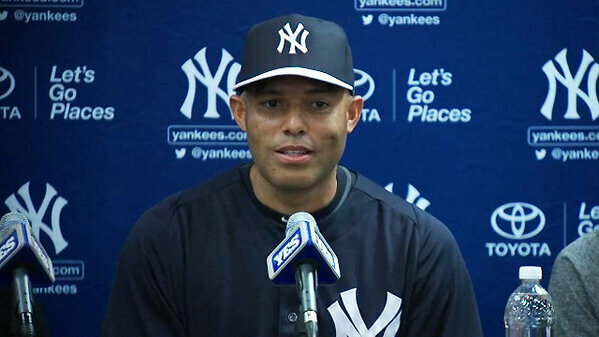 When I remember Mariano Rivera, I’ll remember that news conference, and remember him not only as the greatest pitcher of all-time, but as one of the highest-class individuals ever to don pinstripes. Few players have been more dominant and consistent as Rivera. 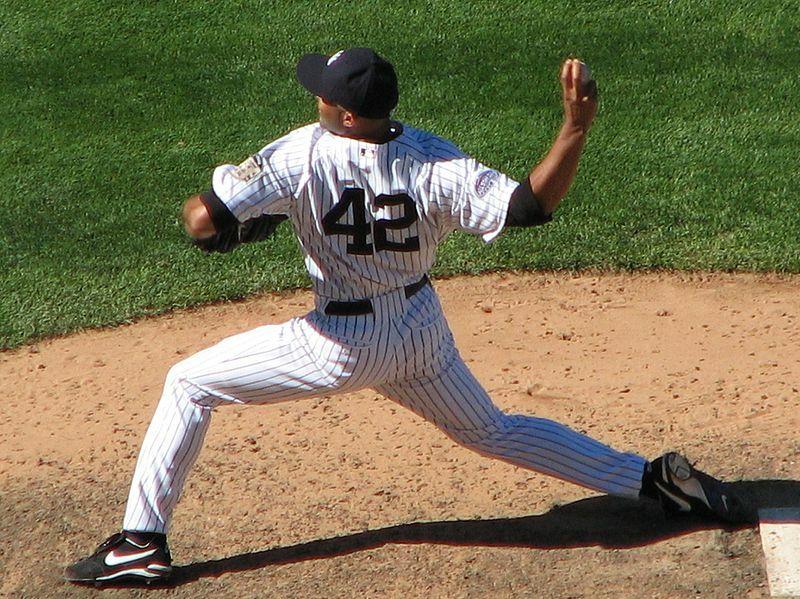 When I think about my favorite Mariano Rivera moment, memories readily flood my mind: his 602nd save, his 3-inning masterpiece in Game 7 of the ’03 ALCS, his MVP performance in the ’99 World Series, the final save at Yankee Stadium. To sift through the trove of incredible moments in his Hall of Fame career is nearly impossible. What I will remember about Mo after he walks off the field for the last time is his remarkable consistency. For the last 17 years every time he strode out of the bullpen we knew we were about to witness greatness in its purest form. Precision. Focus. Execution. Game in, game out. Season after season. No one has done it better in the history of baseball. No one has presided over more saves, postseason saves, or series-clinching saves than Sandman, but what sets him apart even more is how he did it. His supreme talent, his unflappability, his humility, and his class in victory and defeat makes Mo peerless in a game crowded with superstars. To put it simply: we will never see another one like him. 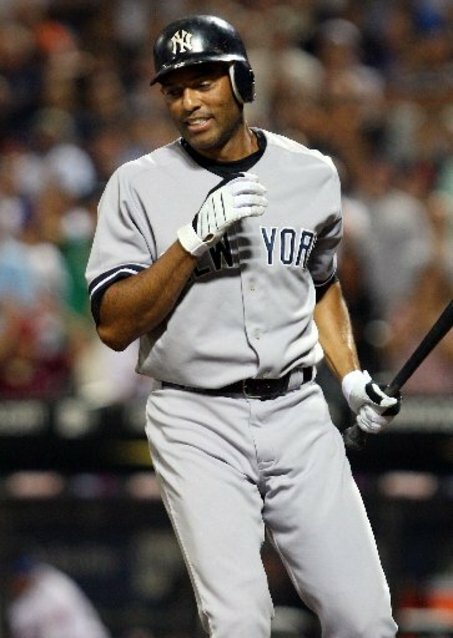 I don’t have one specific instance that is my favorite of Mariano. I think ’96 left a “ring” on all our hearts. We hadn’t won a World Series in how long? Since the 70’s? It was the heyday of the “Core Four” and the dominant mix of Mo, fresh to the majors, in late relief and John Wetteland. Mariano’s played such a vital role over the years and maybe single-handedly won a couple of World Series or “saved” them. I certainly see him as the best closer in history and most fascinating because his consistency in mowing down the league’s best hitters has been incredible. It’s like he drank from the baseball fountain of youth. The guy still throws as well if not better then when he was a rookie. I know no other song played at any sporting event will have the same effect as “Enter Sandman.” A pitcher’s struggling, you see number 42 start getting loose in the ‘pen, pitching coach comes out to the mound, and cue Metallica. Every time I’ve been there in person, a spark of excitement tingles down my spine, I get teary-eyed (I’m a nerd, I know), the crazy dude with the long hair rockin’ out on his air-guitar is up on the big screen and Rivera trots in. 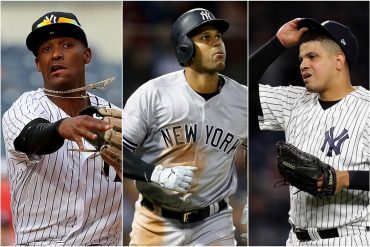 Yankee Nation can feel a sense of relief and closure, that whatever the score may be in the top of the ninth, it’s sure as hell gonna stay that way with him closing, and either our offense has a chance to come back in the bottom or another win is sealed. It’s hard to win over fans to the point where they not only love you but have utter trust in you that you aren’t going to let crucial games slip away. We felt secure with him out there, something that young newbie pitchers don’t give the fans. So depressing to see him go, but THANKS FOR ALL THE GREAT MEMORIES, MO! P.S. Mo won the World Series MVP in ’99 & the ALCS MVP in 2003. 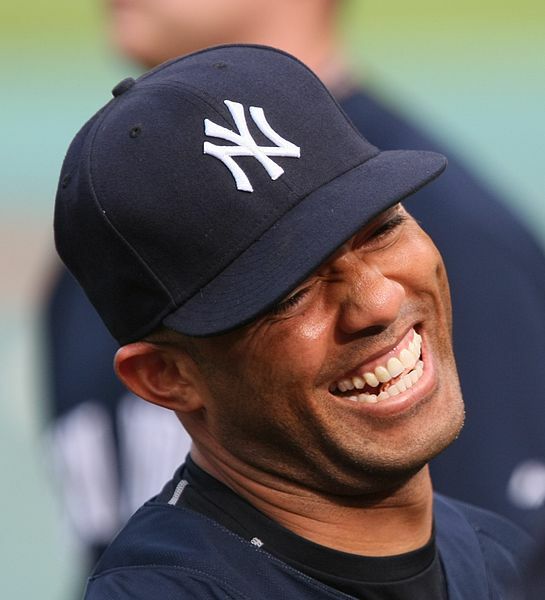 The Yanks have captured 20 postseason awards but Mariano is the only player to win multiple awards as a Yankee.